Ved Bhasin, man who is credited for institutionalizing journalism in Kashmir is no more. Born on May 1, 1929, Ved Bhasin was founder of daily Kashmir Times. The reports reaching this office suggest that Mr Bhasin breathed his last Thursday evening. He was not well for long time after suffering paralytic attack and was confined to wheel chair for his movement. 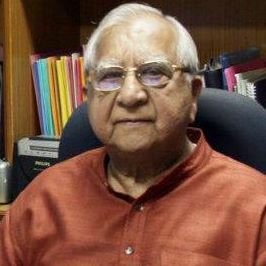 A passionate advocate of justice, peace, and human rights, Ved Bhasin was highly respected in the journalistic circles for his professional integrity and intellectual acumen. Mr Bhasin took a very keen interest in the political sphere of Jammu & Kashmir. He was the President of the Jammu & Kashmir Students Union from 1945 to 1949, the President of the J&K Youth National Conference from 1950 to 1953, member of the National Conference General Council from 1949 to 1953. Afterwards he left active involvement in politics and turned his attention to social, intellectual, and cultural matters of Jammu & Kashmir. Kashmir Life family condoles the demise of the legendary journalist and share sympathies with the bereaved family. For us, it is a personal loss.